Hammock camping is not very popular with everyone. Few factors they find that hammock tents are too expensive, insufficient shelter and might not be comfortable. In reality you can find cheaper hammocks or by building one yourself. 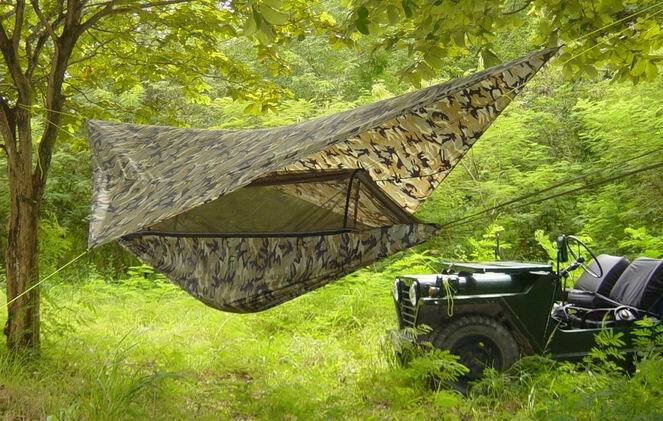 You can extend the shelter or purchase a low cost tarp and hammock camping is comfortable to sleep only if you know how. Hammock started long time ago, however it was more commonly used during Christopher Columbus era on board their voyagers. During WWII, soldiers found that sleeping in the jungle was a real problem such as wet and uneven ground. So they came out with ideas using their blankets and created a hammock. Today hammock camping has taken a new twist. Why hammock camping? For me is the weight and packed size. I used it for jungle hiking and bike tours. For others is the ultimate ultralite backpacking, adventure races, kayaking, soldiers, disaster relief, medical and scientific exploration etc. To make hammock camping comfortable, few innovations had taken shape such as addition of mosquito netting and overhead shelter to protect them from elements of the weather. Below are few Hammock camping tents designed by various manufacturers however I will discuss on one particular model that I owned. Among all the Hammocks, I decided to own the Hennessy Hammock. Few factors for my consideration were weight, setup and design. Hennessy Hammock had all in them. It is comfortable to sleep on, weighing around 1200g, pack to the size of 7" x 10" and it is the lightest and smallest packed hammock in the market. Initially I chose hammock camping is because of the terrain in West Malaysia which I used to frequent. The terrain in Malaysian jungle are wet and moist, uneven ground from the overgrown roots of the trees. So hammock camping was more ideal. However when I came to Taiwan I realised hammock camping was ideal too. The terrain are mostly rocky and the ground are littered with broken Slates which can punctured a hole in the tent, actually it did punctured a hole in one of my tent. I did find some places that I can't do hammock camping such on the rocky river bed and any mountain that is above 2500m sea level where there are very little trees. I am still finding solution to these places using hammock. At the moment I am observing some river trekkers' blog and try to understand the places where they pick their camp ground. My Hennessy Hammock Expedition Asym comes with a hammock, shelter, stuff bag, tree hugger and snake skin. Here are the specifications. Weight: 2 lbs. 12oz., 1175 grams . Suspension system: 10' long 1600 lb. test polyester rope - 42" long x 2" wide nylon webbing straps called "tree huggers"
Canopy dimensions: a parallelogram with - short side - 58" - long side - 87" - short diagonal - 85" long diagonal -130"
Packed size: 7" x 10"
The snake skin design is so innovative that you just have to slide the 2 sides for packing, no more folding. Here is a good video on the snake skin. In the package there are tree huggers to protect the tree barks but I decided not to use here as these tree barks will not be damaged. There are some "must watch" Youtube link I posted below by Ray Mears. In the video he provides an insight guide to tying quick release knots and hammock camping routine. 1. To find the correct distance between 2 trees or poles to setup your Hennessy Hammock. The minimium distance for the hammock is around 3.5 meters so what I normally do is take 4 big step which I estimated around 1mtr each. That should give me the ideal lenght of the hammock. 2. If you decided to tie one end closer to a tree, make sure the other end should slightly higher so that the hammock will be more level. 3. To get the ideal clearance from the ground, I would tie the hammock above my eye level. 4. Before setting the hammock I need to know which side is the entrance or head of the hammock, I would make a knot on one end to mark as the head. Otherwise you can put marking on the rope. 6. Using one of my spare tent pegs for the tarp. I make a loop and a quick release adjustable knot to tension the tarp. On most hammock when you lay in them, they will start to tension and pull the sides towards you. However on Hennessy Hammock you have enough space to spread your legs giving you ample room to move around for different sleeping position. The secret is the symmetrical shape of the hammock, the idea is to lay diagonally and giving you a much straighter posture. The no-see mosquito mesh works great, it does deflect wind and the height is enough for a peek-a-boo to outside world. Overhead there is ridge line, mesh gear pockets and hooks to store your gears such as headlamp, reading glasses, glove etc. Most wear the foot outdoors is camping, and hiking boots and hiking shoes and the best camping tents. For serious hikers and campers, REI has high-end products for backpacking boots.There are locally made tents that are already light and great and for me they are slowly competing against those really expensive branded tents. Mountains is the rain where it requires a wide flysheet to resist rain and moist. I'm interested in trying out a hammock with mosquito netting. Do you know of store in Taiwan (preferably Tainan) that would have a display model?